DAZ Studio Pro Beta 4.5.0.137 READY FOR YOU TO DOWNLOAD! A new version of DAZ Studio 4.5 Pro is being made available for beta testing due to a small number of fixes that will resolve some fairly significant issues for our customers and Published Artists alike. Normally DAZ would not release another version so close on the heels of a major point release. But in this case, some major issues were resolved that DAZ customers needed to have as soon as possible. One of the biggest issues was the update to the 3Delight rendering engine which had impacted area lights in the 4.5.0.114 build. That problem has been fixed and can be beta tested in this build. In addition,changes have been made to how some animation data is saved. Several crash bugs were fixed improving stability and reliability. Useability was improved by adding a side-by-side view mode for the Content Library pane. This version is available to all customers and will run either with or without a serial number - (You will be asked to enter a serial number each time you launch the application until you do so. You may also use your current DAZ Studio 4.x serial number. 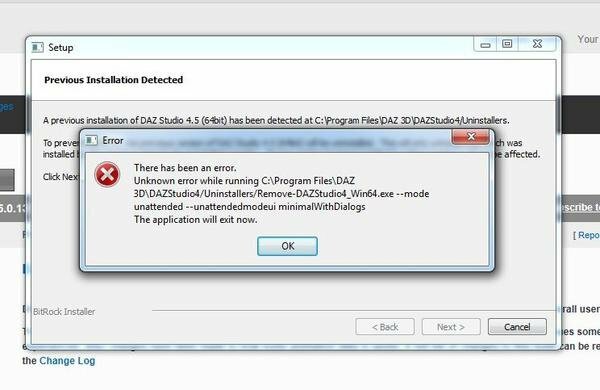 Installing DAZ Studio 4.5.0.137 will uninstall any previous installations of DAZ Studio 4.x, and we recommend running only one version of DAZ Studio 4.x on the same machine. The default content should be updated as well. Running the installer for the content will uninstall the previous version, and replace it with the new content. Having a separate install for content will make the download size smaller and quicker to obtain. How do I get DAZ Studio 4.5.0.137? 1. Separate Software and Content installers, for quicker and easier installs. 2. Selectively save parts of a scene - Save only those items in the scene that you choose, rather than having to remove items from the scene before saving. Then, easily drop that scene subset into another scene using lightweight DSON format files. 3. FBX Import - FBX files can now be round-tripped through DAZ Studio, including rigged and animated items in the scene. 4. New "Ready to Render" scenes - New scenes that are "Ready to Render" have been added as part of the content that is available for DAZ Studio 4.5. Loading these scenes is a great way to start tweaking and playing with some cool scenes. 5. Geometry Shells - This new feature helps blend the textures, shaders and geometry of Geo-Grafted parts to the figure. This will provide a much cleaner feel to grafted geometry. It also allows the capability to work like instances of the original shell. 6. Instancing - Instance items in your scene to copy and scale the original item multiple times saving memory and video resources. 7. Group Node - Similar to layers in paint programs, you can group objects in a scene like a 3D layer. What other capabilities are in DAZ Studio 4.5? 1. Full implementation of the DSON file format specification - This enables saving scenes in a lightweight format that can be loaded and used by anyone who has installed the products used in the scene. If one or more of the assets used in the scene are not found while the scene is loading, a simple preview is inserted into the scene in its place and a dialog is displayed indicating which files are needed to load the scene in its entirety. 2. View port speed dramatically increased - For many interactions, view port speed will be 2-5 times faster than DAZ Studio 4.0. 3. Load and use most Poser format files as if they were native DSON files - Scenes that are constructed using items loaded from Poser format files and then saved to the DSON format, are also sharable; they maintain references to the required Poser files, rather than the contents of those files. 4. Consolidated viewing/editing of Property Settings - The Property Settings dialog now consolidates more editable information about each property into a single interface; e.g. Presentation Editor, Controllers, Sub-Components, Keys, etc. 5. "Darkside" style is now included - You no longer need to download and install this style separately, it is included as part of the standard installation. 6. Shader Mixer improvements - Shader Mixer has significantly improved workflow and documentation. Along with many new features in DAZ Studio 4.5, you will also find new documentation on some of the deeper functionality in DAZ Studio on the Documentation Center in the Publishing and DAZ Studio sections. What should I know about this build? 1. Many, many issues and workflow improvements have been addressed since we released 4.0.3.47. Too many to list here. Please see the DAZ Studio 4.5 Change Log and the DAZ Issue Tracker for more detail. 2. Files saved from this version of DAZ Studio are NOT backward compatible with older versions, including version 4.0.x. 3. Plugins that run in version 4.0.x will not run in version 4.5 without being updated by their respective developers. Many of the plugins developed by DAZ 3D are included in the download(s), but may still require a serial number to unlock. 4. Not all features of FBX are supported on import, so characters from other 3D applications imported in FBX format may or may not come through with all their components. 5. All newly saved presets are recorded in the lightweight DUF format and script based presets (DSA/DSB/DSE files) have been phased out. Many of the script based save presets can still be saved and will load, but the new preset format should be used in their place. 6. The phased out ".DAZ" scene format can still be read, but the option to save to this format has been removed. 7. Support for Poser format content that makes use of Propagating Scale and/or Dependent Parameters (valueOpKey) has been updated. This can cause the behavior of items that use these features to change. 8. The 3Delight render engine included with DAZ Studio 4.5 has been updated to version (10.0.50). This may cause some compiled third party shaders to require an update. Shaders that were compiled using the tools provided in DAZ Studio 4 should already be compatible with both DAZ Studio 4 and 4.5. These shaders should automatically recompile at render-time, but will warn that the shader should be recompiled to improve performance. Shaders built using Shader Mixer are not subject to the change and should continue to function without an update. 9. We suggest that in order to use the PW Shaders you reset your downloads to get the latest version to run with DAZ Studio 4.5. 10. Both DAZ Studio 4.5 Pro AND DAZ Studio 4 Pro files are included in the download you get from the product page in the store. If you got the installer from the DAZ Studio Landing Page the DS4 Pro files ARE NOT included. What about DAZ Studio 4.5 compatible add-ons? to be run once you've done this one for the DS installer. security is not the proper way to do it. Well, this isn't a happy process. Gets as far as somewhere round the end of the uninstalltion of prvious version when the uninstall errors out with some message about segmentation error or something. Acknowledging it, the main installer crashed. It didn't try to uninstall this time and installed, but a message came up about a problem installing the CMS. As 1st run. Toward the end of the uninstall that it, of course, ran, the uninstall errored with the segmentation message again, and on acknowleding it the installer crashed. As 2nd run, No uninstall ran this time, and install finished, but with the same vague message about a problem with the CMS install. There's something wring with the uninstall process, and I'm not entirely sure if all the 4.5 stuff was cleaned ot, or whether some bits are hanging around liable to cause trouble. There's something wrong with the CMS install process. And while I don't use the CMS at the moment, I'm not wildly happy that this beta can't even install it without trouble. And running the dynamic clothing control installer was like the main app installer: it wanted to uninstall the previous version, I clicked to go ahead, and just round the end of the uninstall, the uninstaller crashed out with the error message about child killed:segmentation violation, and when I acknowledged, the main installer crashed out as well. 2nd run didn't ask to do an uninstall and proceded to the end. Something is wrong with these uninstallers. (or something was wrong in the last version with the uninstallers it created). This is a beta, right? I mean, there were alpha testers, and they ran these installers on systems that had the public 4.5 installed, and didn't get these installer/uninstaller problems? I didn't run into any problems installing and the Area Light definitely does work now! Thank You, Thank You! Anyone else having trouble getting the Genesis Essentials content? I'm getting a "download not found" page. Actually, do we need to install it or will the last version work? Can't get Genesis Essentials either and merging a character into a scene causes them to explode. Oddly I can merge older characters into scenes without them blowing up (for now), I just can't save anything to work on later because the new file format does not work. Damn it Daz, get yourself sorted out. Hmmm, think I'll hold off. DAZ seems to be rushing things a bit here..... YUK! Update worked for me.My security software however signalled a virus or something like that as it did for many of the recent builds. Isn't it the Issue for some people? ANOTHER Beta? So soon after the Release Candidate fiasco? For God's sake ... when will you people learn? The aim is stability, not endless updates! As an aside, how many of the recently re-compiled addons are invalidated by this release? Oh, and by the way, resetting the download for DAZ Studio 4.5 does NOT get 4.5.0.137 - it still gets links to 4.5.0.114. Working good so far in Linux/Wine (32 bit). No problems to report. The new Side-by-side view in the Content Library is interesting. I'm waiting on a response on the availability of 3DL 10.0.62 standalone. That is my only "worry" about this update. I use the Linux Standalone 3Delight for rendering, and usually 3DL doesn't like compiled shaders from other versions. No chance yet to test in the PixelSamples bug in 3DL is fixed yet in 10.0.62, but word has it that it was fixed a little while ago so the bug fix may be in this version. I'mgetting an error when trying to install. The installer gets to the unistall previous version, I click OK. I think I'll stay on 4.0 for a little while longer, but is there any centralized place for information about the progress on DAZ 4.5? This is kind of disturbing somehow. Also I didn't found anywhere any "technical" setup instruction for installing/upgrading to this version (what to install in which order). I found 2 different versions of Installation-Guide-Windows.pdf but none of them seems to have any contains about upgrading without losing your content. The download list for my version includes installers for DAZ 4.0.3.47 as well... Should them be installed first for some twisted reason? Stupid question: I guess it's not possible to install both 4.0 and 4.5 on the same computer? EDIT: BTW, This is my first post on this forum :) Hi everybody! Ehm - because people want working area lights? I don't think my problem is with this build's installer. I don't appear for some reason to have an unistaller. Lefauve no you can't have both 4 and 4.5 at the same time. If you use DS for your job, like I do, I'd definitely recommend sticking with version 4 for now. 4.5 is really messed up in that you lose 80% of your content (that you've spend tons of hours organising) and the CMS stops finding things and generally you end up pulling you hair out (and I don't have much left!). Trying to get 4.5 to work cost me a small fortune in lost time. Thankfully I'm on a mac so used time machine to go back to the happy days of 4. Wow! This is my first post since 2003! Looks like you've been caught by the same issue that I and others have - can I assume you "Reset" DAZ Studio 4.5 and are trying to re-download the Genesis Essentials 1.3? If so you're downloading what you probably alredy have - you need to reset the DAZ Studio Beta and the Genesis essentials will be 1.4 - and will actually download! The problem I was having with installation seems to have been on my end. I've got 4.5 instlled no problems so far. it doesnt seem to be a problem except shes not showing up as dials under parameters or shaping, her parts head ear spikes etc are under Parameters but not her. I've reinstalled her but the problem remains. I did notice when applying a Lana material to Genesis; the first option on context menu invites you to do the wrong thing and 'Add as New'. That issue was addressed in another thread a week to two (or three) back. The upshot is that you can track down that specific file and delete it. 2 . I need to uninstall ds 4.5 product ver? 3. I need to uninstall, genesis Starter Essentials contents? 4. I need to stop CMS before install this beta ver? 5 I need to install some plug-in again ? or they can run without problem with new ds 4.5 beta? 6 if I install it, some my handmade products and meta-data remove? 7 if I install it, is there some bad news which I can do it on ds 4.5 product ver well? for me, what I lose (if it has problem) is more improtant than the improvements from ds 4.5 product ver. EXACTLY .... and the question that you should ask is why those lights were not working after the end of the original beta and Release Candidate process. Such a fundamental issue should have been picked up long ago in the 4.5 development cycle and NOT still be present in what was alleged to be the "release" version. But I suppose if you enjoy installing version after version after version after version then I understand your point of view. And this is a beta version, not a release. Nobody says you have to install it. If you don't need working area lights, you can still go with the official release. The betas are for people who like to work on betas. If you don't want to, you don't have to. which are selling in daz shop . I am not guest who exciting new technology of star-ship. at least for those who bought products in daz shop. and wait user who paid money. in principle. actually they can update when removed the bug, and can release it for user. I think. all of customer not hope to be tester for DAZ.beta or RC1.2.3 . I think ds 4.5.0 114 is just RC3 they shoud nam it as RC version. I feel DAZ many time make miss announcement for selling the product. I just want to use daz items which I bouoght in daz shop, in daz studio without problem. I want not to install beta ver, but if I do not, I can not use the product which I bought! Plugins and shaders should still work - if they were working in 4.5.0.114, of course. But this doesn't include any of the PoseWorks shaders (the ones now sold as "DAZ Originals")... have they not been updated for 4.5 yet? No reason to ask, the reason is known: there was a bug in the 3Delight rendering engine. It was not under DAZ's control, nor did anyone find it until it was too late. From your comments I can surmise that you are looking for a reason to "down" 4.5... guess what, it works VERY well with fewer hiccups than some other software that I can name that I have had to pay for. I find it interesting that for a few *here* the fact that DAZ provides prompt updates is a fault, when that is actually a strength. Users of other (very expensive) software would be ecstatic to get updates as often as DAZ provides them. In fact, those forums are replete with complaints that updates don't happen enough. Then there are the "WAAAHHH! DAZ has created a new version with better features, but someone with an error between the keyboard and chair has complained! I'm not upgrading, and it's all DAZ's fault!" people. Folks, one or two people reporting a problem is a GOOD THING! That means that everyone else is not having problems. Hundreds of people reporting a problem is a bad thing. Maybe I'll just "buy" 4.5 to make it easier to keep track. This is because of an applied pose, designed for a figure other than Genesis and saved before 4.5.0.114, that changes the rotation order. This breaks the binding to the rig. If the same scene is created in 4.5.0.114 that won't happen as DAZ Studio won't let you change the rotation order thought he pose will still work, as well as it did before.